clean raspberry pi install behind TV | Portland! This exercise room TV has only a power cord, network cable, and two headphone leads visible from the front. 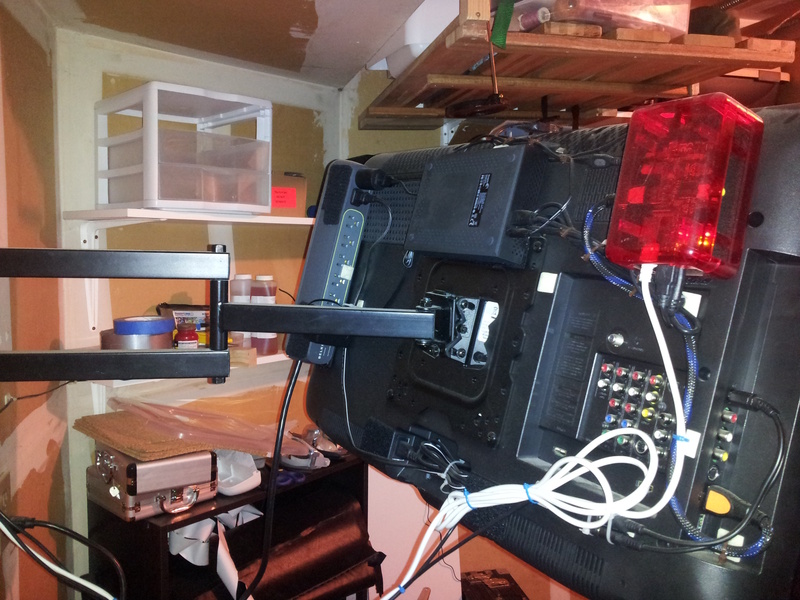 Behind, it has a raspberry pi, USB hard disk, connections to the TV, IR remote lead, headphone extensions and a swing arm mount. Everything is attached in a way that doesn’t interfere with the swing arm and lets it sit against the wall. I’m seeing this more and more; the kinds of things that you want next to a TV are really small and light nowadays, and TVs are really flat, so it makes a ton of sense to just stick it all on the back. 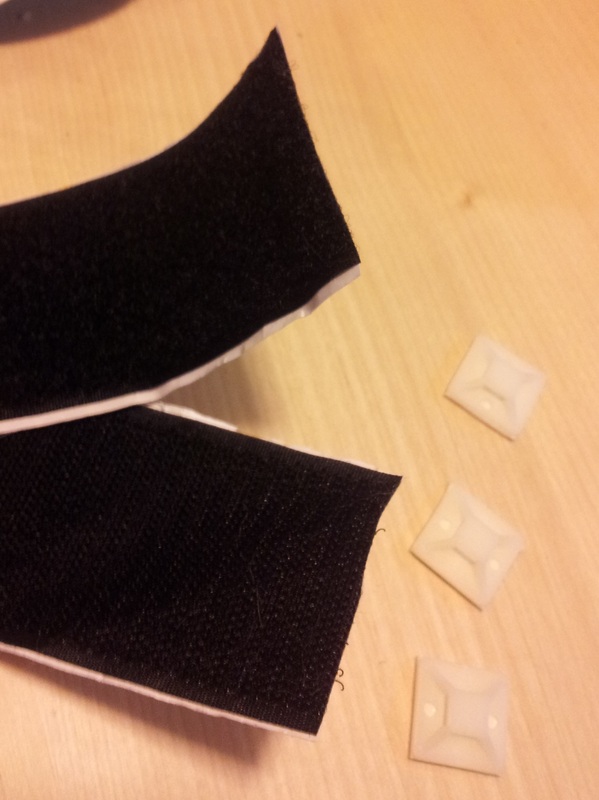 I used sticky-backed velcro tape and sticky backed cable guides with zip ties. Don’t be shy with the velcro, I don’t trust it holding more than a pound or so per square inch for something that I’m not going to be checking on and pressing together as needed. 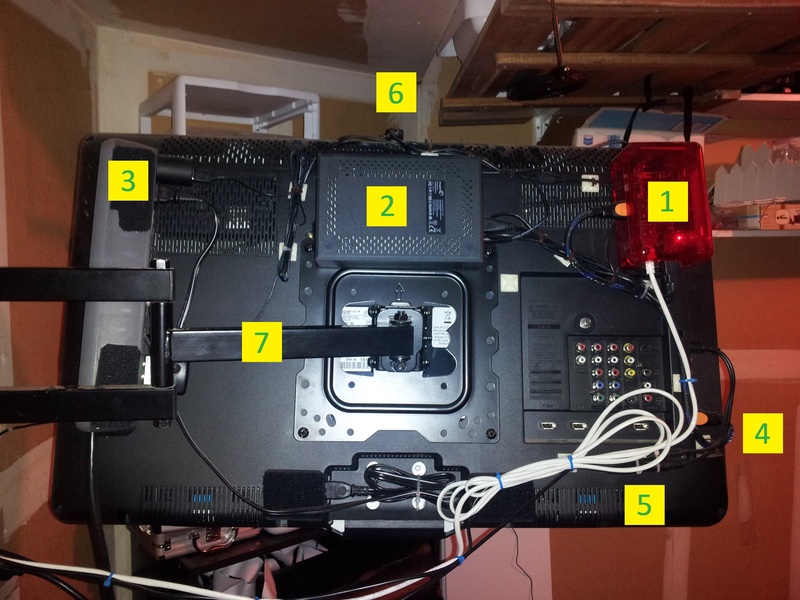 Heavy things can be cable tied to the structure of the TV or VESA mount (the cooling slots are a good place to thread cable ties, for example). The raspberry pi runs file serving (samba), torrents (transmission-daemon) and plays videos on the tv (XBMC). It manages about 5MB/s on samba going out the lan port- not the best, but enough for most 1080p videos it might have to share. 1. pi in enclosure (BUD industries sandwich enclosure). This case doesn’t hold the pi very securely so I super glued it in place (to the tabs). I wouldn’t buy it again, but it’s fine once glued. 4. short HDMI cable- I got a 2 footer so it wouldn’t be coiled up. 5. ethernet cable, audio Y cable, and two 12 foot headphone extensions- these help hear the TV while exercising. Volume control is important with a splitter- each side gets its own volume wheel, one built into a set of headphones, one Koss VC20 inline volume control. 6. IR USB dongle for the wireless keyboard, on a short USB extension cable. It peeks over the top of the TV. 7. swing arm- “videosecu cantilever swing and tilt” from amazon. 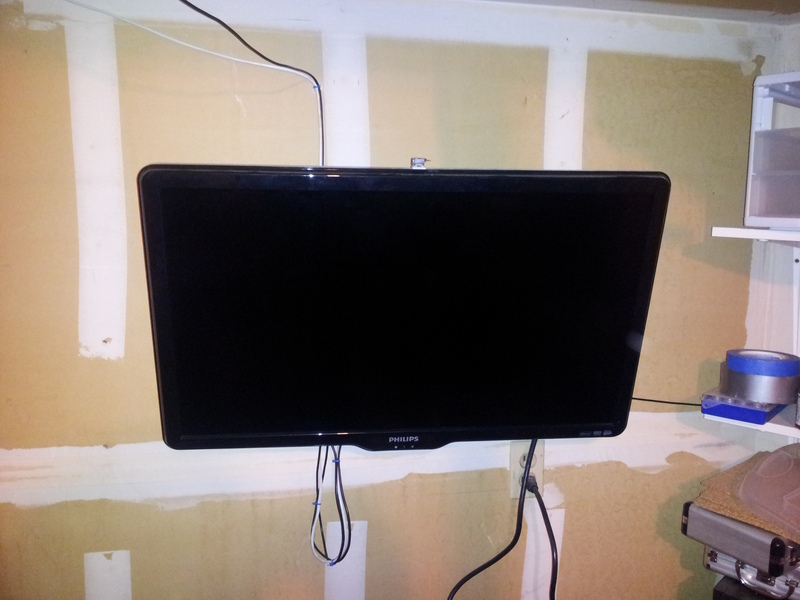 Flat TVs are light enough that they don’t need much to hold them up, and this ended up really solid (and only $30). This entry was posted in Uncategorized on 6 October 2013 by larsonm.